These days, there is a lot of hype in the press about the race to get 5G networks off the ground. All press reports I’ve come across so far are about non-standalone network deployments in which the 4G network is the anchor for the connection and 5G resources are added when available. For an intro see my post from back last year on 5G Dual Connectivity (EN-DC). At some point, however, we will also see networks that support 5G in standalone mode in which there will be a 5G core network and devices that only talk to to 5G base stations (the gNode-Bs). 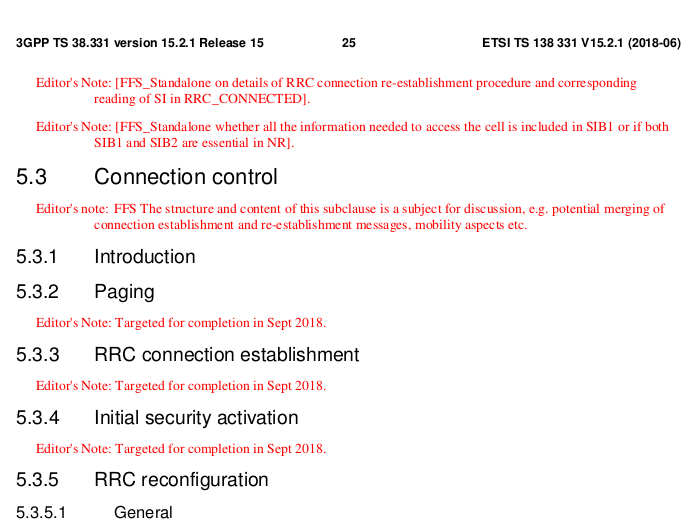 Today, I wanted to take a look at how the RRC (Radio Resource Control) specification for 5G standalone looks like and was quite surprised that major parts are still missing from the corresponding specification document 3GPP TS 38.331. The screenshot above shows the beginning of the connection control chapter of the latest available version of the Release 15 specs (2018-06). As you can see, pretty much all at the beginning of the Connection Control chapter is still a red ‘Editor’s Note’ that promises completion for September 2018. Don’t get me wrong, this is not a complaint, I am just surprised that this is not yet in place. But then, everybody is quite busy with 5G Dual Connectivity and procedures for that are described in 3GPP TS 37.340. Previous Previous post: The FDroid Store Compiles Apps Itself!